Mark Dever speaks at the 2017 9Marks conference on Leadership. Jeramie Rinne speaks at the 2017 9Marks conference on Leadership. 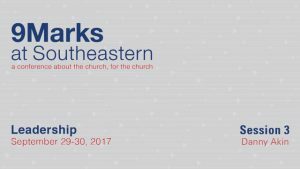 All speakers come to discuss leadership at the 2017 9Marks conference. Danny Akin speaks at the 2017 9Marks conference on Leadership. Thabiti Anyabwile speaks at the 2017 9Marks conference on Leadership. Burk Parsons speaks at the 2017 9Marks conference on Leadership.